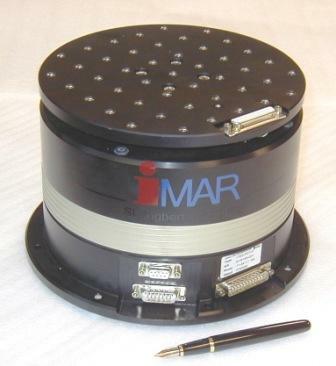 iMAR manufactures gyroscopes and inertial measuring systems in all classes of per­formance. Beside of our sensor and navigation products we also provide gyro test equipment. With the iTES-PDT07 iMAR pro­vides a high preci­sion single axis angular rate system for testing of gyro­scopes, accelerometers and smaller IMUs (e.g. MEMS based IMUs, MEMS gyroscopes) under labora­tory con­ditions. iTES-PDT07 comes with a RS232 inter­face, which is used to control the turntable. Commands are available like “constant rate”, “angular step”, “absolute angular position” or “adjust angular acceleration”. Furthermore a CAN interface is available to monitor the motion in realtime. The system is powered by 24...48 V DC (option: 14…34 V). For multi axes IMU testing or for operat­ing heavy loads please refer to our testing systems iTES-14, iTES-19, iTES-24, iTES-29 and iTES-39, which can be delivered with or without an additional temperature controlled chamber.